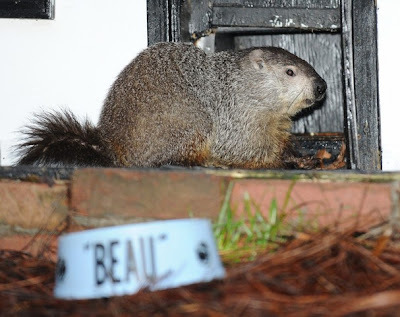 Georgia’s Furry Forecaster, will make his Annual Weather Prediction at the Yellow River Game Ranch just before 8:00 am Eastern on Saturday, February 2, 2012. 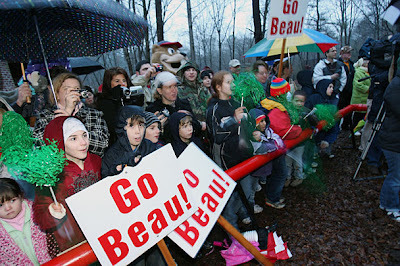 Beau will meet and greet hundreds of bleary-eyed, faithful supporters at sunrise as he seeks his shadow. Free admission will be granted to the groundswell of fans from 7:00 to 7:30 am (Media admission 6:00 am). Gifts honoring Beau are appropriate. If Beau spies his ample shadow, citizens far and wide may anticipate at least six more weeks of woe-be-gone winter. Should Beau not see his shadow, prepare for Spring-like temperatures within the next six weeks. Like last year when he pioneered the use of live streaming video for weather prognostication, Beau will first announce his prediction on his Twitter page (@GameRanch). This year, Instagram users can follow Beau’s photo stream at @GameRanch. Tons of photos of the special event will be posted by Beau and Game Ranch staffers. Sounds like a plan? Here's all the necessary details if you are planning to attend. WHAT: Ground Hog day. Come see “Georgia’s Official Weather Prognosticator” General Beauregard Lee !!! Stroll along a mile long trail on 24 wooded acres and encounter over six hundred birds and animals indigenous only to Georgia We specialize in “people-friendly”wildlife! Great family outing. Free admission to “Beau Believers”: Anyone who has a birthday on February 2nd will also be granted free admission for the day. Appropriate photo identification or visa is necessary.